Over the last several legislative sessions, we have built a bipartisan consensus to move forward on a public pension reform proposal to address flaws in the current system and protect the taxpayers who foot the bill. Senate Bill 1 is a bipartisan public pension reform plan that includes the first ever 401(k) style (or defined contribution) plan ever for state workers and teachers. In passing this bill, we will reduce the unfunded liability by at least $5 billion – the cash savings and effect on the funds. Depending on the systems’ investment returns, thanks to new risk-sharing provisions, additional savings could be between $5 and $20 billion. We are re-balancing the risk between taxpayers and employees. - Hybrid A (1.25 percent benefit rate, 10 years vesting for Defined Benefit (DB), three years for Defined Contribution (DC). This is the default option. Employees will pay more, 8.25 percent of salary for the 1.25 percent hybrid – a strong DB will need to be paid for. - Hybrid B (1 percent benefit rate, 10 years vesting for DB, three years for DC). - This historic plan will save more than $5 billion. An additional savings of up to $3 billion is projected in terms of reduced costs and fees for investment management. - The public pension reform plan will provide future employees retirement security while further protecting taxpayers. - The retirement age is increased to 67 years old. - Current employees will have the opportunity to opt in to a new plan or continue in their current plan. - Our pension crisis contributed to the state’s credit bond rating reductions and threatened our fiscal stability. This public pension reform plan looks to the future as it protects the Commonwealth’s interests and puts the systems on a sustainable path going forward. - Support for the public pension reform plan has come from state and local chambers of commerce, ALEC, the Pew Charitable Trust, Americans for Prosperity, the Commonwealth Foundation and others. 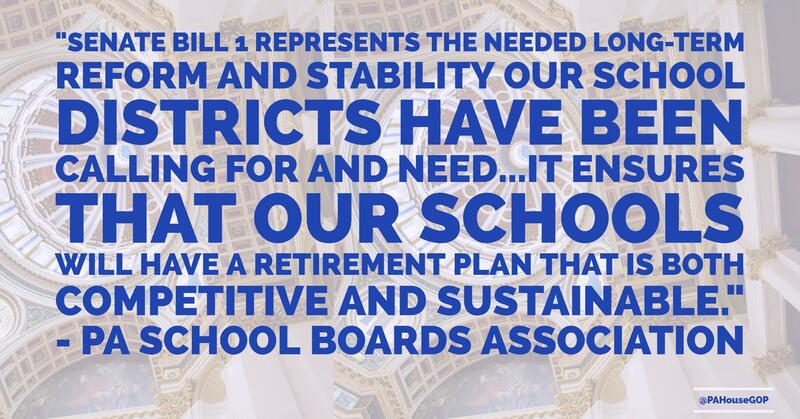 What Does This Pension Reform Plan Accomplish? • Bipartisan Consensus. 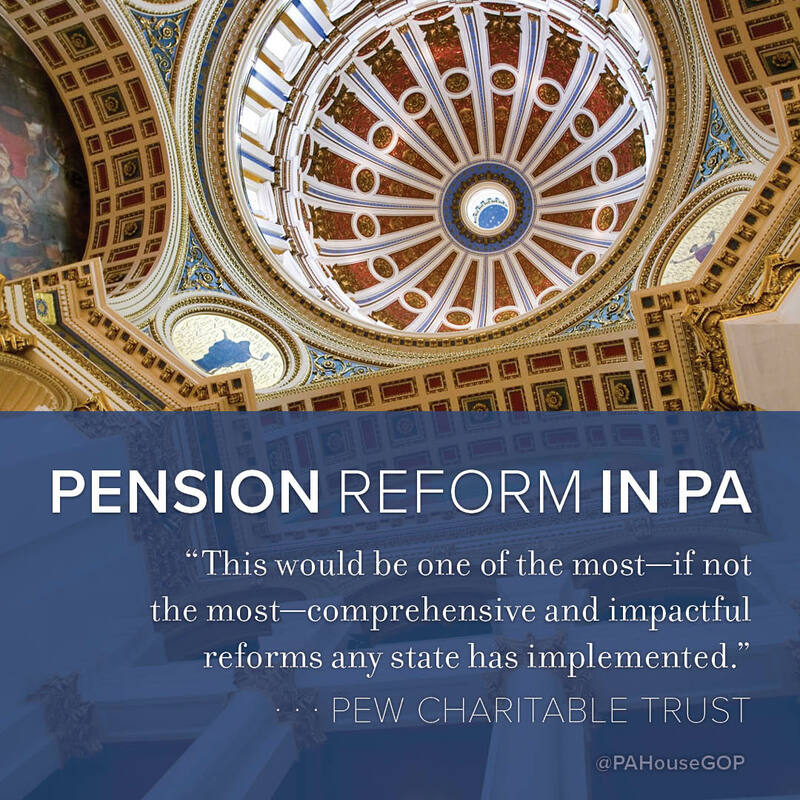 Working together, Republicans and Democrats, the Senate and House and Governor Tom Wolf, we crafted a fair and responsible public pension reform plan. Each segment of the plan has been publicly vetted through committee hearings and debate. • A culmination. Over the last several legislative sessions, we have built a consensus to move forward on a plan to address flaws in the current system and protect the taxpayers who foot the bill. While not perfect, the proposal establishes a state 401(k)-style plan. • Taxpayer Protections. The public pension reform plan’s changes to Pennsylvania’s public pension systems will provide taxpayers some protection in case of economic downturns. • Protects hard-earned benefits. The plan works to protect the benefits that hard-working Pennsylvanians have already earned. Under this plan, no current employee or retiree would see any changes to his or her plan. • Delivers competitive benefits. The public pension reform plan provides new employees with retirement benefits that are desirable and competitive with those they would receive in the private sector. The plan also improves the portability of benefits. • NEW workers only. The historic changes to the public pension systems will apply only to future state and school employees who first begin service in 2019 (Jan. 1, 2019, or July 1, 2019, respectively). However, existing employees will be given the opportunity to opt in to one of the new plans if they choose to do so. • Introduces a “DC” plan for public employees. In 2019, EVERY new state and school district employee will be in some form of a Defined Contribution (DC) plan. The public pension reform plan will allow future employees to opt into a “DC-only” plan in lieu of a hybrid plan. A DC component is also a part of the hybrid plan. • Responsibly shrinks the “DB” plan. In a fiscally responsible manner, the plan narrows the Defined Benefit (DB) plan option. • Not just a “quick fix.” The public pension reform plan would make fundamental changes to ensure we can responsibly meet our statutory obligation to the retirement systems moving forward. • Savings. With investment fee reductions and reforms, the estimated savings are in the billions of dollars. The SERS reform savings realized will be plowed back into the unfunded liability of our pension system, resulting in even more savings over time. • Stops the bleeding. This plan is step one in implementing meaningful pension reform. Stopping the bleeding from within the current system will help reduce annual taxpayer contributions over time. Who Is Supporting This Plan? 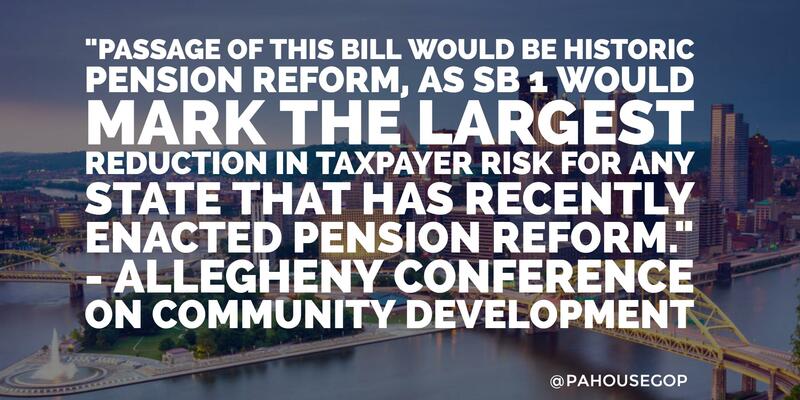 Why Is Pension Reform Needed in Pennsylvania? Due to years of underfunding, huge declines in the market and previous benefit increases, Pennsylvania now faces a more than $62.7 billion pension debt (unfunded liability), which will take decades to overcome. The scale of the pension debt has contributed to the state’s credit bond rating reductions and threatened our fiscal stability. Senate Bill 1 is a long-term pension reform effort that protects the Commonwealth’s economic stability and puts the systems on a more sustainable path going forward. - provide protection for taxpayers, sustainability for current retirees and workers, and a competitive, more personally controlled benefit for newly hired workers. - provide long-term budgeting stability for the state, which can help prevent future tax increases. - ensure workers – past, present and future – enjoy a competitive retirement benefit without overburdening taxpayers.